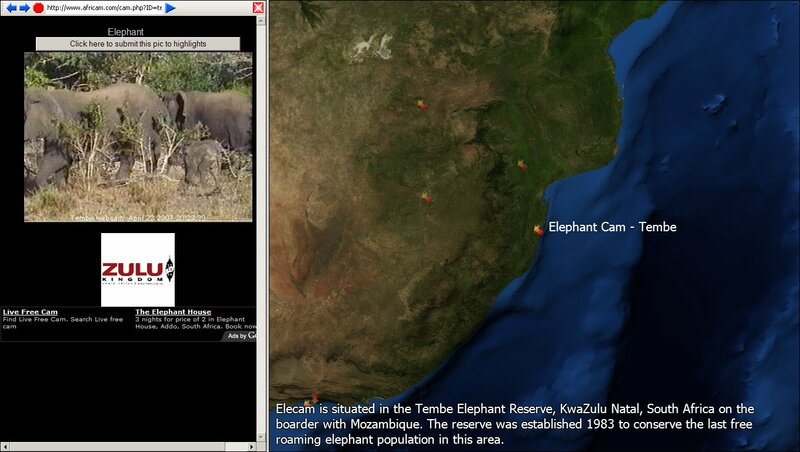 Another Add-on I have been working on with MadMappers is the Africam Add-On, Africam has a several cameras in Africa which view the local wild life, this add-on lets you click a camera and opens the view from that camera in World Wind’s internal browser. While most cameras are best viewed during Africa’s daylight hours, some are equipped with infra-red which makes for good night time viewing, especially the streaming nkhoro cam, includes a 30 sec advertisement before streaming starts, this camera also has audio and I have personally been unnerved by hearing a large predator growling in the middle of the night, followed by sounds I can only imagine being a smaller animal screaming, followed by crunching sounds. Instructions and a download link can be found here.